Resorts and hotels generally use utility vehicles in more ways than other facilities. Think bell service, housekeeping, room service, food service and maintenance. To accommodate these needs, Club Car now offers vehicles configured for specific resort applications. Club Car, manufacturer of Carryall® work utility vehicles and a brand of Ingersoll Rand, is committed to uncovering resort transportation problems and devising creative, cost-effective solutions to them. Most recently, they have leveraged the expertise of their Custom Solutions Department, which designs unique vehicles for specific applications, to launch two series of vehicles that improve productivity at resorts and hotels: Fit-to-Task and Showcase Vehicles. According to Richard Whitfield, manager of the Custom Solutions Department, customers in the resort industry have a long history of ordering custom vehicles for specific tasks. This indicated a need for task-specific vehicles. “With that in mind, we analyzed the global buying patterns of resorts and created new vehicles configured with the accessories commonly ordered for specific resort applications. The cars can be further customized to fit their individual needs,” Whitfield said. Club Car is the only manufacturer offering full lines of preconfigured task-specific vehicles designed to solve resort transportation problems. 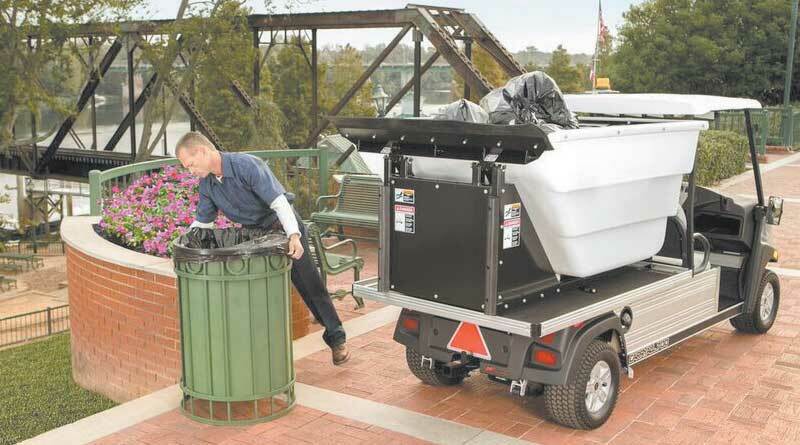 Others may add a stake side kit to a utility vehicle used for trash pickup. This limits capacity and leaves trash exposed to guests during removal and transport. Some even use bungee cords, ropes or duct tape to protect grounds maintenance gear and equipment in the beds of utility vehicles, when a bed-based attachment system such as the VersAttach™ tool carrier protects equipment, frees bed space and limits round trips. “Further, DIY customization is generally less efficient, and may increase a resort’s regulatory risks, create safety hazards and limit options. It may even impact the vehicle’s warranty,” Whitfield said. “Resorts can now order Fit-to-Task and Showcase vehicles fully equipped for the task at hand – whether they need a car for laundry, security, or facilities and grounds maintenance. These new vehicles simplify ordering, speed delivery and boost productivity. Many of them are available on various platforms, and most accommodate additional accessories if needed. Two-wheel drive cars come in gasoline or electric models; 4x4s in gasoline or diesel. The vehicles are built on reliable Carryall platforms with rustproof aluminum frames. They are backed by the same warranty as other vehicles in that class, and reviewed for regulatory, safety and engineering requirements. Replace trucks and vans with utility vehicles that cost less to operate, maintain and insure. Boost versatility with task-multiplying accessories. Switch to multi-passenger vehicles, cutting fuel, maintenance and vehicle costs. To learn more, visit clubcar.com, contact your local Authorized Club Car Dealer, or email CustomSolutions@ClubCar.com. Villager™ 8 Bell Service Vehicle: A limo-like car that seats six passengers and comes standard with luggage bed, stake side kit, hand truck holders and extended canopy with triple garment racks. Site Visits/VIP Transport: The Precedent® Stretch with four forward-facing seats fosters comfort and conversation. Available with rear-mounted personal item storage. Food Service Vehicle: Features lockable food service van box with a 68-rack tray, 10-shelf rack, drip edges and lockable doors. Available with or without insulated compartments. Fully customizable. Room Service Vehicle: Keeps guests coming back for seconds with a lockable van box equipped with shelves and a food warmer box. Other options are available. Housekeeping Vehicle: A lockable L-shaped van box carries a full-size vacuum cleaner and more. Shelves hold supplies and linens, and drawers carry small items. Laundry Vehicle: Comes with large plastic hopper and bed lift to discreetly move laundry across a resort. Facilities Maintenance Vehicle: Choose from three Carryall platforms: mid-size, long bed or street-legal LSV (low speed vehicle). All come standard with the choice of dual locking van or tool box systems, standard top-mounted dual ladder racks, tie downs and rear receivers. Ground Maintenance Vehicle: Choose long bed or mid-size model with hose reel and electric rewind. Transporter™ XL: This versatile vehicle transforms from a four- to six- to eight-passenger vehicle, with corresponding bed sizes for hauling. Standard limited slip axle delivers 4×4-like performance. Refuse Removal Vehicles: Large hopper lets you quickly and discretely remove trash from your site. Standard or high dump models. Can also be used for carrying twigs, branches and other materials. Four-wheel Drive Work Utility Vehicles: Select two-passenger, four-passenger, six-passenger or snow-removal models, all with automatic 4x4s that sense the ground they’re on and shift as needed. Add power steering and more. Security Vehicle: Built on the affordable Carryall 300 platform, it features the tightest turning radius in its class and comes equipped for safety and comfort. Choose from three models, all with standard stretchers, storage boxes and medical-attendant seats. Carryall 300 Ambulance: Affordable compact car with the tightest turn radius in its class. Mid-sized Transporter Ambulance: Larger vehicle available with a Stryker hydraulic lift for loading and unloading patients. Four-wheel Drive Ambulance: Allows access into areas other utility vehicles can’t navigate. Automatic 4×4 senses the ground it’s on and shifts as needed. Stryker hydraulic lift is available.